Both Acer's two 3D monitors are priced fairly well, at $689 for the 27-inch model and $449 for the 23.6-incher, but if you can stretch for the larger size you'll get NVIDIA's 3D Vision glasses thrown in for good measure. The smaller-sized monitor will come with Acer's own 3D glasses, otherwise. Both handle full HD 3D through HDMI or DVI-DL, inputting from PCs or game consoles; cameras; Blu-ray players or set-top box 3D. On sale shortly. SAN JOSE, Calif., April 14, 2011 – Acer America Corp., the number one provider of 3D displays worldwide(1), today debuts its new Acer® 3D Series Displays for customers in North America. 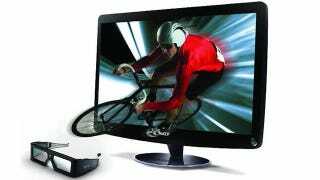 The new 27-inch (HN274H) and 23.6-inch (HS244HQ) widescreen 3D LCD displays are the ultimate visual medium for enjoying the vivid realism and depth of three dimensional entertainment and learning. The new 3D LCDs provide thrilling full HD 3D visuals via HDMI or DVI-DL to PCs, Blu-ray Disc™ Players, game consoles, cameras and 3D TV programming via a set-top box. Supporting the HDMI 3D solution, the displays deliver immersive 3D broadcasting, Blu-ray movies, gaming and photography. The solution is also ideal for schools, as education content providers create new 3D curriculum that makes learning more engaging. Providing a complete 3D package, the monitors include NVIDIA® 3D glasses with active 3D shutter technology. The monitor itself has a built-in IR emitter, so no external IR emitter is needed to connect to a PC. With a set-top box, users can view the latest in satellite 3D TV programming or host a 3D movie party with additional 3D glasses and simple connection to a Blu-Ray Disc™ player. Measuring 22.6-inches (W) x 16.6-inches (H) x 6.8 –inches (D), the HS244HQ is a practical size for more space constrained areas. It supports HDMI 3D and boasts a very high 12,000,000:1 contrast ratio, which showcases the crispest whites and deepest blacks for exceptional viewing definition of all content. A quick 2ms response time enables immersive graphics and enhanced video display for incredible visuals that literally pop from movies, games and photographs. The 1920 x 1080 resolution delivers excellent detail, making these displays perfect for advanced 1080p full HD gaming and widescreen cinematic playback. The LCD active matrix TFTs have a 16:9 aspect ratio and support full HD resolution with a refresh rate of up to 120Hz – far exceeding the mandatory requirements for full HD 3D movies, games and TV. The fast 2 ms response time yields incredibly realistic graphics and video. The LED technology consumes up to 68 percent less power than standard LCD displays – saving energy and money. Environmentally-conscious, the displays are durable, RoHS compliant and constructed of mercury-free white LED backlight. They also come in recyclable packaging materials. The Acer 27-inch (HN274H) and 23.6-inch (HS244HQ) Widescreen 3D LCDs are available for U.S. customers at leading retailers with MSRPs of $689 and $449, respectively. Both come with a three-year parts and labor limited warranty(2) .